Thank you Malc. I looked for the freshest flowers I could find and fortunately their colors melded. 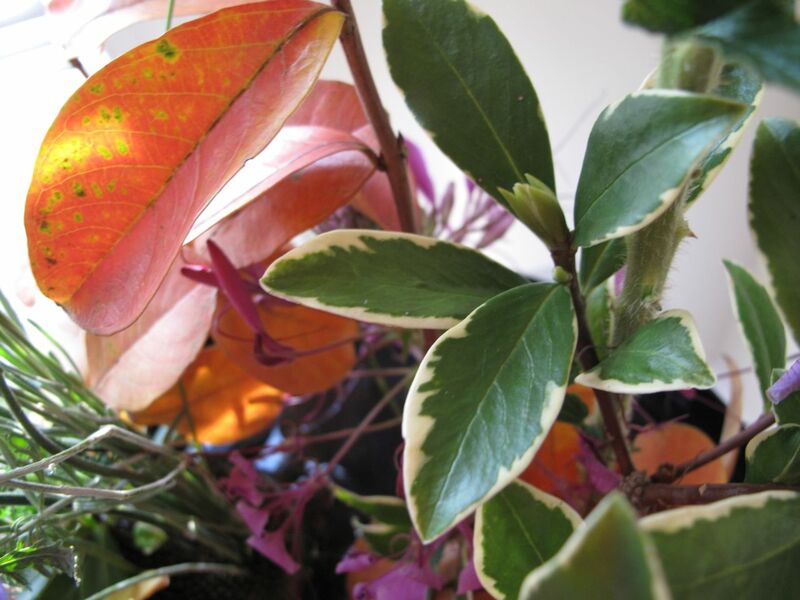 Judy, I can imagine your vase next week of evergreen branches in one of your favorite containers. A few small sprigs would be charming. Join in! Clever, Susie, and how amazing to have all the seasons represented in one vase. I really like the shape and height of your arrangement today, very fitting for Cathy’s celebration. Thanks Christina. I had planned to just put everything into a small vase, but quickly saw I would need the Kenzan pin holders to get the Clematis to stand up. Glad I spent more time with it. I wondered how the clematis was kept upright, they are usually so floppy. Sad to report I just checked on the arrangement (which I made yesterday afternoon) to see if it needed more water. The clematis didn’t even last overnight. 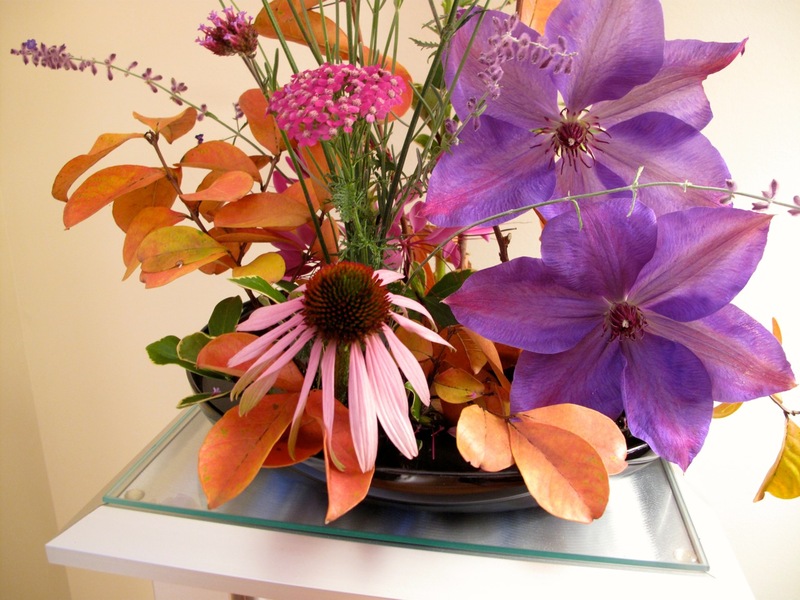 Clematis are really only a short term cut flower but they did make a great impact in your arrangement. You probably didn’t have anything else to represent spring so worth it even if it was only for a day. That looks so light and airy – beautiful! It is also quite professional-looking. I have inherited some ikebana frogs (some solid, some articulated) from my grandmother and a bowl, but I have never dared to use them. You might have inspired me to try! Thanks Karen. I’d love to see the articulated pins especially–had only seen the solid round or oblong ones before doing a quick search just now. Delightful. Am glad to see your Jackman is still producing. I only had one blossom this fall and that was weeks ago. John, I’m so surprised at how well the Jackmanii continues to bloom. Too bad your clematis didn’t give a better fall show. Hope the camellias are still doing well though. An impressive assortment of blooms, beautifully arranged. Thanks Linda. The long drawn-out autumn has done wonders for flowers this year. You’re so kind Annette. Glad you found this cheering. Sometimes I think I’d enjoy working in a florist shop, but I’m much too slow to be productive. I didn’t take time to condition these flowers, but was disappointed in the short life of the clematis. Will have to experiment with them again sometime. I was happy the colors “played well” together. Making vases has become a Monday tradition–thanks for the opportunity. Your arrangements always look so professional Susie. 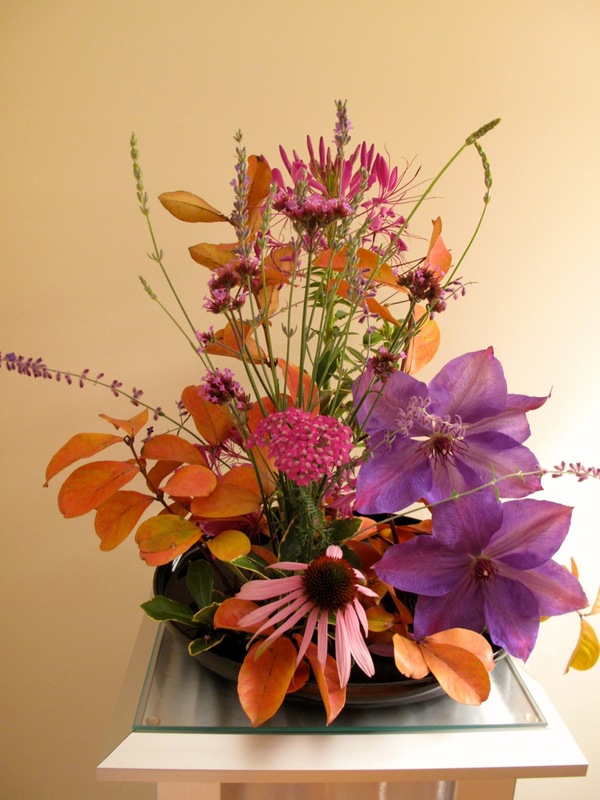 I love the colour combination and the idea of including the 4 seasons in one arrangement. It is absolutely gorgeous. Thanks very much Liz. It’s surprising what we all have been able to find each week in our gardens throughout the year. What a lovely homage to Cathy’s meme and your own garden, Susie! Thank you Kris. I wanted to do something special for her anniversary and am glad my flowers cooperated. Outstanding clematis flowers (shame about them not lasting long – I’ve never tried them in a vase before and we haven’t planted any here yet). A really professional, elegant arrangement. You have a touch! Thanks for your nice comment Cathy. I’ll have to experiment more with clematis and see if there’s a way to extend their lives in a vase. Christina noted they’re only a short-term cut flower, but I expected at least 24 hours. This is such a delightful offering. I LOVE your design work, one of your many talents. How about you teach some classes. The idea of a vase a week has held up well. You are the ‘idea’s’ star pupil. Thanks for being so supportive Stepheny! Don’t think I’d ever be able to teach flower arranging but am so glad to be able to practice each week. I’ve learned a lot from the other participants. One of these Mondays I hope to see some of your design skills put to work. Wow Susie you have been creating for almost a year yourself. I adore this vase as it has many surprises and a bit of everything for all seasons. A perfect celebration. Yes, I wouldn’t have guessed it was that long. The garden is still full of wonder, even though I haven’t spent much time taking care of it this summer. Nice to still find a few things in bloom. PS: I posted your photo and blog address just now on my Facebook. Hope that’s okay. Thanks for your kindness Cathy. I did fall in love with that orange and purple combo. That was a thoughtful idea Susie, a lovely result too. Thanks Julie. It’s hard to believe how quickly the weeks have gone by. Each Monday has been fun. 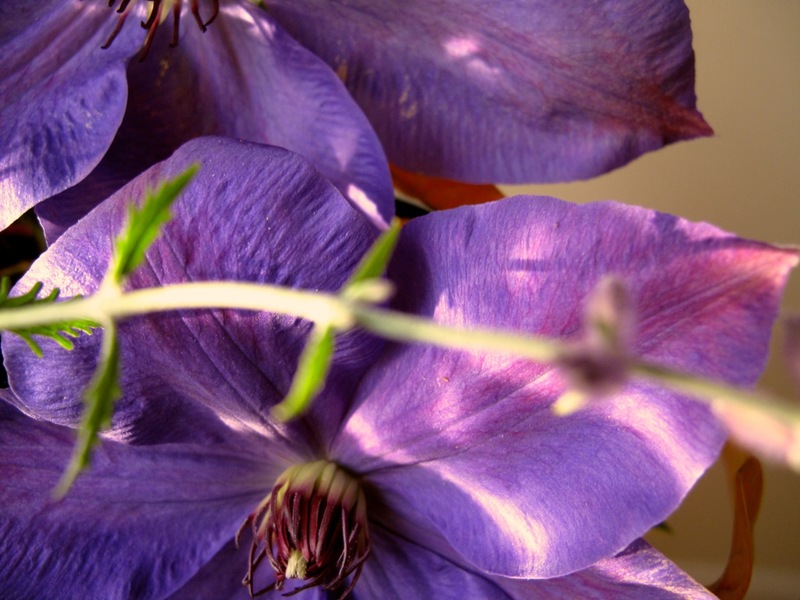 A lovely reminder of the seasons Susie – how lucky to have your clematis flowering in autumn! It has been a true pleasure to visit you here and see all your lovely vases and other posts – am glad I found you via Cathy! Julie, thank you. I’ve been so pleased to have found you also. You always inspire me to try something a little different. Oh wow, I always love what you do, but this has to be one of my favourites. Love the shape overall, and the colour combination is just gorgeous. Thanks so much Janet.When I saw the orange crape myrtle’s leaves the other morning I just had to find a way to include it. Same with the clematis. This arrangement is really amazing: the color combinations and the representation of each season…….it’s the ‘Four Seasons’ indeed. So nice to hear from you today. Finding something from each season was easier than I would have expected. The nice long drawn out autumn revived so many flowers and protected others. I was happy the colors combined so well. Take care. Love the purple-orange-pink combination. I had no idea that crape myrtle had such striking fall color. What a beautiful bouquet! Orange and purple and bright fuchsia pink make a great combination, and the paler pink of the coneflower makes a very nice accent. Thanks. Those colors seem too brazen to work together but they soften and work together pretty well. Unfortunately the arrangement itself was not long-lasting. There is so much to learn about the habits of flowers.